Madam O Mahashay by Shirshendu Mukhopadhyay Bangla pdf file. Branches of complex life 'Madam O Mahashay' is an another excellent social novel by Shirshendu Mukhopadhyay who is the creator of best fiction character 'Fatik'. Readers can enjoy the remarkable novel by collection the pdf file from link below. The book pdf has 135 super quality pages with 21mb size. 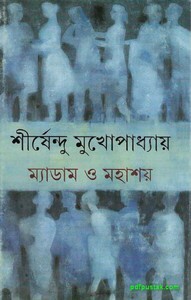 The novel is one of the most magnificent creation of this Bengali author.